New portrait definitive Canada stamps were issued during 1954 to replace the 1953 Karsh Issues. These new portrait definitives, featuring a right-facing profile of Queen Elizabeth II, were much better accepted by the public, and they would continue in use as the standard lower-denomination definitive stamps of Canada until 1962. The period from 1954 to 1956 also featured the continuation of the wildlife series, the conclusion of the Prime Ministers series, and quite a few commemorative stamp issues. The wildlife-themed Canada stamps shown above were issued between 1954 and 1956. With the exception of the 15 C. denomination, they were all issued in April of each year, in conjunction with National Wildlife Week. 4 C. (1954 - Scott #335) - Walrus. 5 C. (1954 - Scott #336) - Beaver. 15 C. (1954 - Scott #343) - Gannet. 4 C. (1955 - Scott #352) - Musk Ox. 5 C. (1955 - Scott #353) - Whooping Cranes. 4 C. (1956 - Scott #360) - Caribou. 5 C. (1956 - Scott #361) - Mountain Goat. These lower-denomination definitive Canada stamps, featuring a right-facing portrait of Queen Elizabeth II, were issued beginning in 1954. These new stamps had a much more attractive appearance than did the 1953 Karsh Issues, and they were readily accepted by the public. The sheet and booklet format stamps are perforated 12. 1 C. (1954 - Scott #337) - Violet Brown. 2 C. (1954 - Scott #338) - Green. 3 C. (1954 - Scott #339) - Carmine Rose. 4 C. (1954 - Scott #340) - Violet. 5 C. (1954 - Scott #341) - Ultramarine. 6 C. (1954 - Scott #342) - Orange. The horizontal coil stamps are perforated 9 1/2 vertically. 2 C. (1954 - Scott #345) - Green. 4 C. (1954 - Scott #347) - Violet. 5 C. (1954 - Scott #348) - Ultramarine. 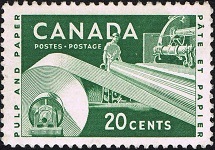 Beginning in 1962, the sheet format Canada stamps were coated with luminescent bars for use in automated mailing equipment at Winnipeg, Manitoba. Positioning of the luminescent bars varies. 1 C. (1962 - Scott #337p) - Violet Brown. 2 C. (1962 - Scott #338p) - Green. 3 C. (1962 - Scott #339p) - Carmine Rose. 4 C. (1962 - Scott #340p) - Violet. 5 C. (1962 - Scott #341p) - Ultramarine. The third in the annual series of stamps honoring Canadian Political Leaders was issued on November 1, 1954. They are shown above, at the top. The fourth and final issues in the annual series of stamps honoring Canadian Political Leaders was issued on November 8, 1955. They are shown above, at the bottom. 4 C. (1954 - Scott #349) - Sir John Sparrow David Thompson (Lived: 1845-1894, Prime Minister: 1892-1894). 5 C. (1954 - Scott #350) - Sir Mackenzie Bowell (Lived: 1823-1917, Prime Minister: 1894-1896). 4 C. (1955 - Scott #357) - Richard Bedford Bennett (Lived: 1870-1947, Prime Minister: 1930-1935). 5 C. (1955 - Scott #358) - Sir Charles Tupper (Lived: 1821-1915, Premier of Nova Scotia: 1864-1867, Prime Minister: 1896). The 5 C. denomination commemorative stamp (Scott #355) shown above was issued on June 30, 1955 to celebrate the 50th Anniversary of the Founding of the Provinces of Alberta and Saskatchewan. The design is a symbolic representation of pioneer settlers. 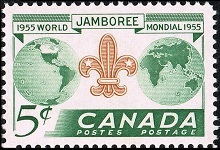 The 5 C. denomination commemorative stamp (Scott #356) shown above, at the left, was issued on August 20, 1955 to celebrate the 8th Boy Scout World Jamboree, held at Niagara-on-the-Lake, Ontario. 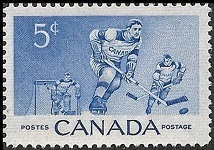 The 5 C. denomination commemorative stamp (Scott #359) shown above, at the right, was issued on January 23, 1956 to celebrate Canada's most popular winter sport ... Ice Hockey! The 10 C. denomination pictorial definitive stamp (Scott #351) shown above was issued on February 21, 1955. 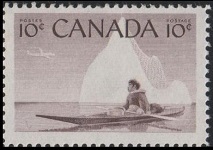 The design features an Eskimo riding in a Kayak. 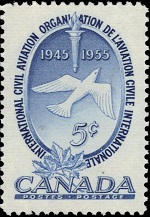 This 5 C. denomination commemorative stamp (Scott #354) was issued on June 1, 1955 to celebrate the 10th Anniversary of the International Civil Aviation Organization (ICAO). The design features a torch, dove, and maple leaves. The 20 C. denomination pictorial definitive stamp (Scott #362) shown above was issued on June 7, 1956, and it celebrates Canadian Pulp and Paper Manufacturing. 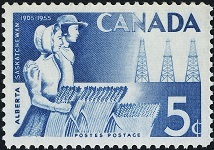 The 25 C. denomination pictorial definitive stamp (Scott #363) shown above was issued on June 7, 1956, and it celebrates the Canadian Chemical Industry. The 5 C. denomination stamp (Scott #364) shown above was issued on October 9, 1956 to promote Fire Prevention. The central design, a house in flames, emphasizes the needless waste caused by preventable fires.